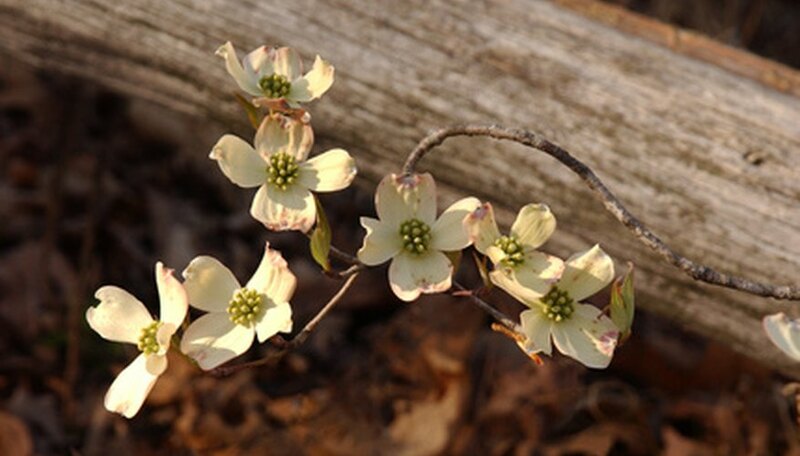 The dogwood, while common in USDA hardiness zones 5 through 9, is most common in North Carolina. It is popular in home and commercial landscaping because of the early spring flowers and bright red berries. The dogwood leaves turn purple and red during the fall. Several bark diseases affect the dogwood. When planting new dogwood, there are several steps to help prevent bark diseases. When choosing dogwood for landscaping, be sure the trees are healthy. If any trees are contaminated, they will infect other trees and plants in the landscape. Be sure to select a good site in the yard. The best site promotes rapid drying of foliage and has good-draining soil. The dogwood does not need to be pruned, except in the spring and throughout the growing season to remove dead and decaying wood and plant matter. Dogwood anthracnose is caused by Discula destructiva, a fungus that was first noted in the 1970s in Pennsylvania and New York. Eventually, the disease spread throughout the Appalachian Mountains, West Virginia, Virginia and Maryland. It was first noted in North Carolina in 1987. The fungus attacks the bark, twigs and leaves, and leaves conidia (masses of spores) on the infected bark. It starts out with tan blotches on the leaves. The blotches have a purple border, and the disease is easily confused with leaf spots. The fungus spreads to the twigs and the trunk of the tree. It causes brown cankers on the bark. It might also cause epicormic branches to form on the trunk and some of the larger branches. If the tree has multiple cankers, the cankers could surround the trunk and eventually kill the dogwood. Crown canker is caused by Phytophthora cactorum, a disease that causes a canker to grow on the trunk of the dogwood near the soil line. Crown canker usually attacks dogwoods that are newly planted or dogwoods that have root injuries. It is commonly seen on dogwoods in areas with poor drainage. The cankers eventually cover the trunk and kill the top of the tree. It causes leaves on the tree to be smaller than normal, and the leaves might shed early. Dogwood canker is another disease that causes cankers on the dogwood's bark. It affects the trunk and the larger branches. The canker shows up as rough areas. Insects invade the rough areas. Eventually, as with other cankers, the cankers grow around the entire trunk and kill the tree. Treat diseases with the appropriate fungicide. Depending on the disease, different fungicides might be needed. Your local nursery provides you with the proper fungicide for anthracnose or canker.